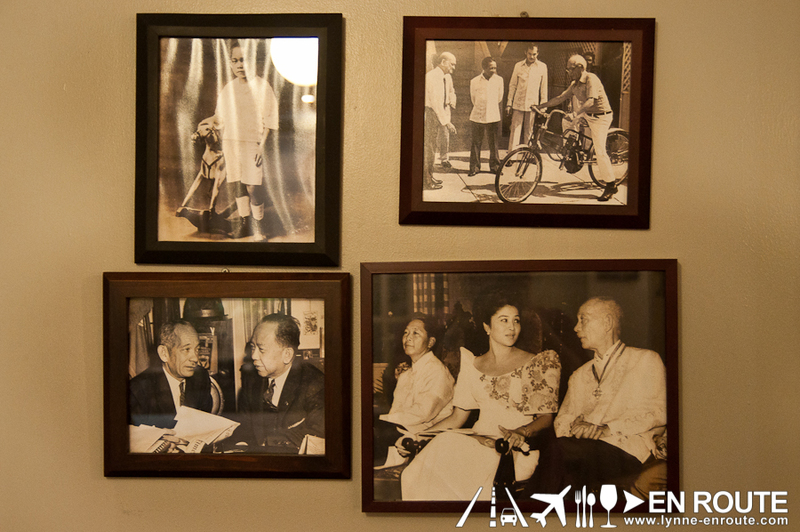 It seems that retrofitting houses into restaurants is one of the more popular methods in getting yourself known into the Filipino food scene. After all, everyone likes a good story, and houses always provide such. From Cafe Xocolat and Ninyo Fusion Cuisine in Katipunan area, to Juanito Bistro in Kapitolyo, and the cult favorite Lime 88 Street Food in Mandaluyong. There’s just too much to mention and all of them, for sure, have stories to tell. Hard to beat, however, is a story about a house from a clan that has made a living out of telling the stories. Not fictional stories, but journals. These are real stories of the world published into the broadsheets that influence the nation that reads it. 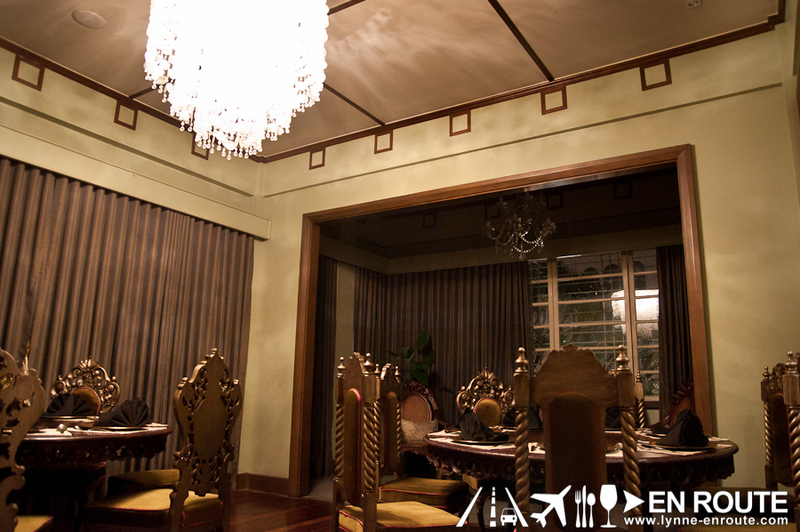 This is what Casa Roces near the Malacanang grounds of Manila is all about. 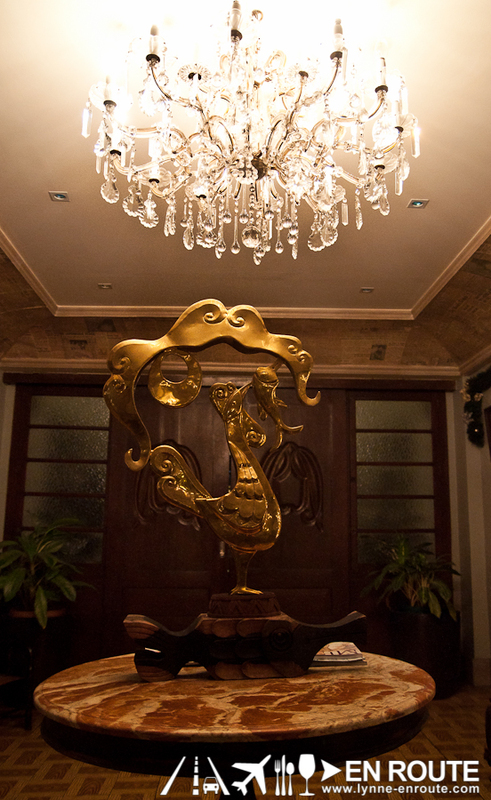 Casa Roces was the social house of one of the prominent families that have survived through generations of Spanish, American, and Japanese occupation in the Philippines. 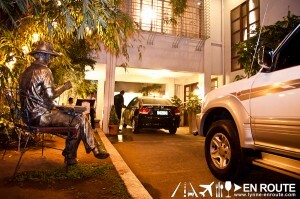 This also used to be the home of the National Artist Alejandro Roces. 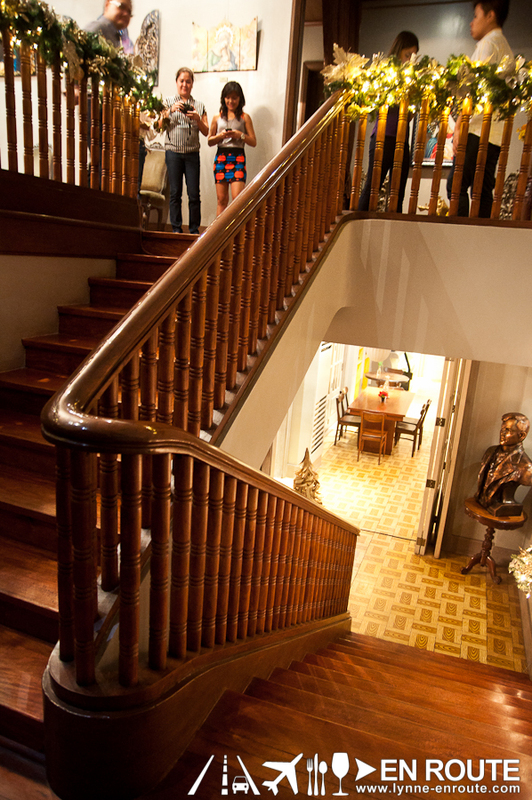 The house’s proximity to the Malacanang palace says a lot about their ties to the political scene of their days. It is literally just across the street. 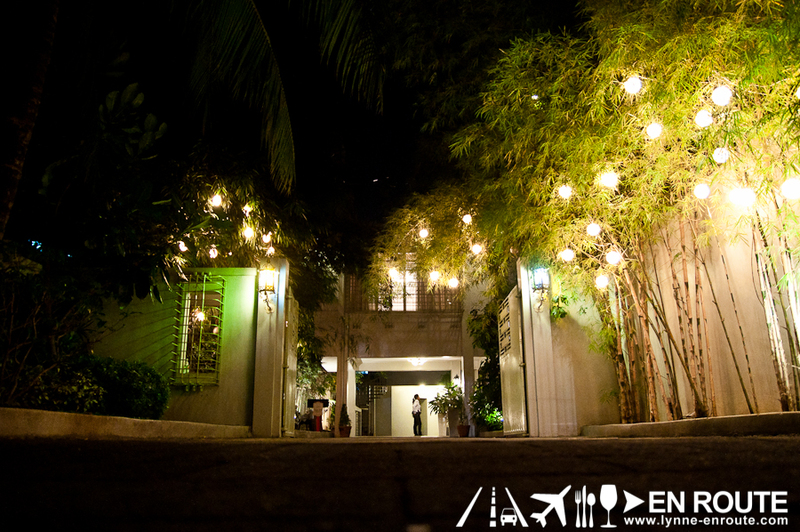 And just across the street, the gate of Casa Roces greets you in style. 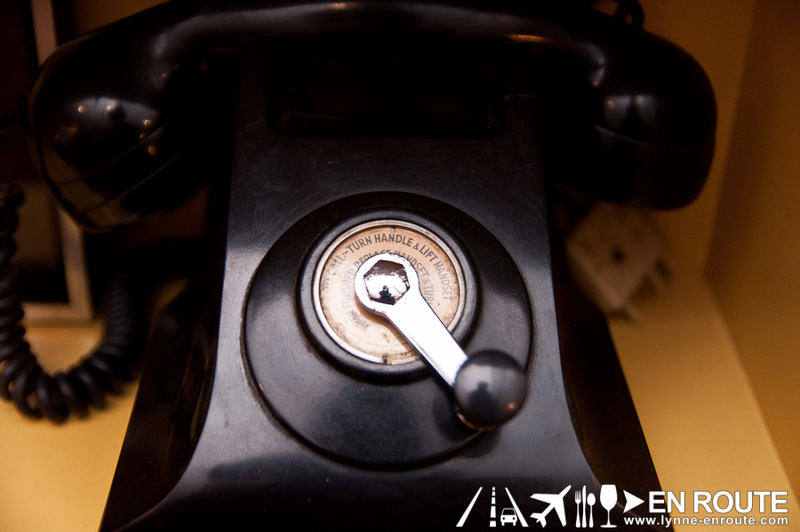 Valet parking is available, given that no real parking is really set for this place. The valet drivers park and move the vehicles along the streets as space becomes available. This does seem to be the normal case of houses that have turned into restaurants. The lobby speaks of the heritage of this clan of journalists and social icons. 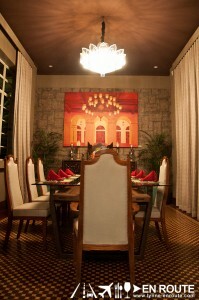 An elegant yet dated looking chandelier illuminates pictures of presidents, leaders, and other close friends of the clan through the ages. 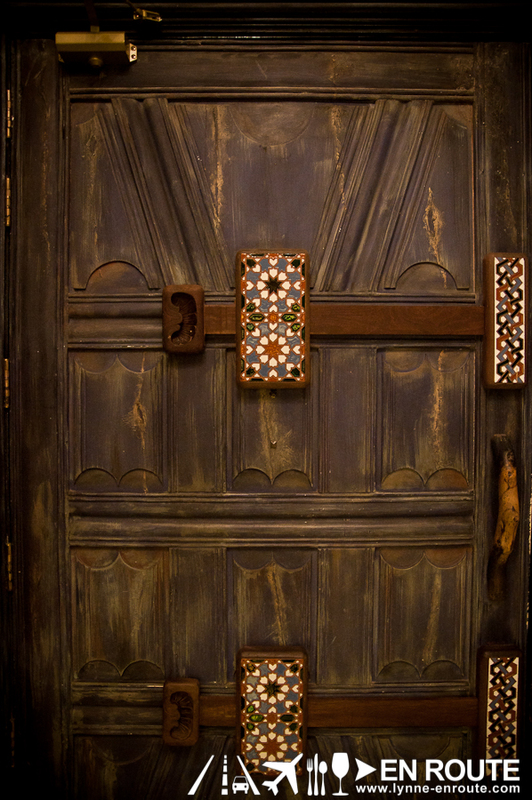 The old wooden door speaks volumes of the many people that have entered here through the decades that have passed. 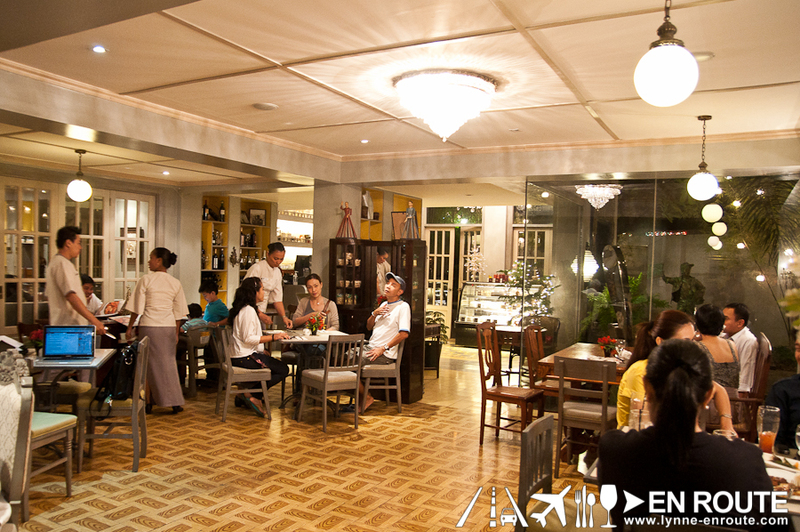 Past the welcome lobby and it is a bit more of a restaurant feel already. 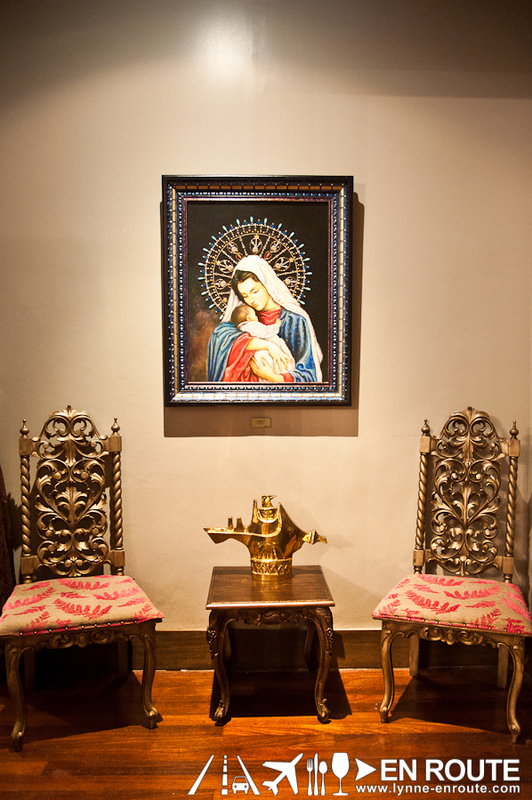 It is more relaxed with old trinkets adorning walls and crevices, making it looked lived in. The vibe is very casual, making it inviting for family dinners. Al fresco dining? The garden has become the extension of the dining area. 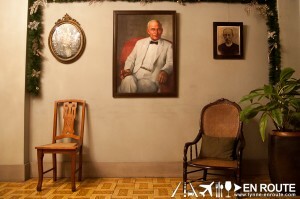 The second floor, however, feels like a continuation of where the lobby left off. 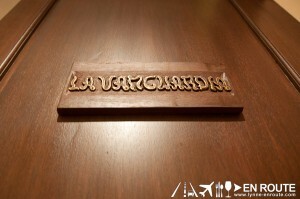 Long wooden planks for steps and floor boards, intricately carved chairs and tables, and of course, more chandeliers. Story has it that these are excess furniture from the clan’s other homes, and therefore express their style and convictions. 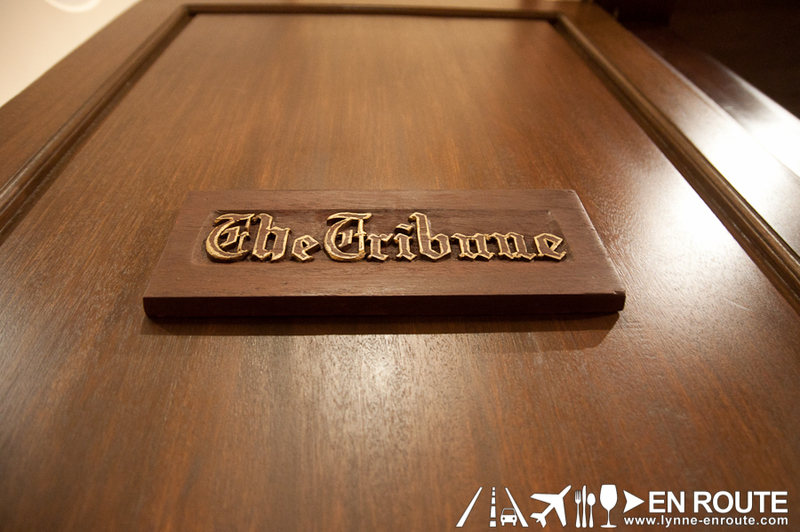 The second floor is divided into rooms named after the periodicals and newspapers that were or are still handled by the clan from days gone by. 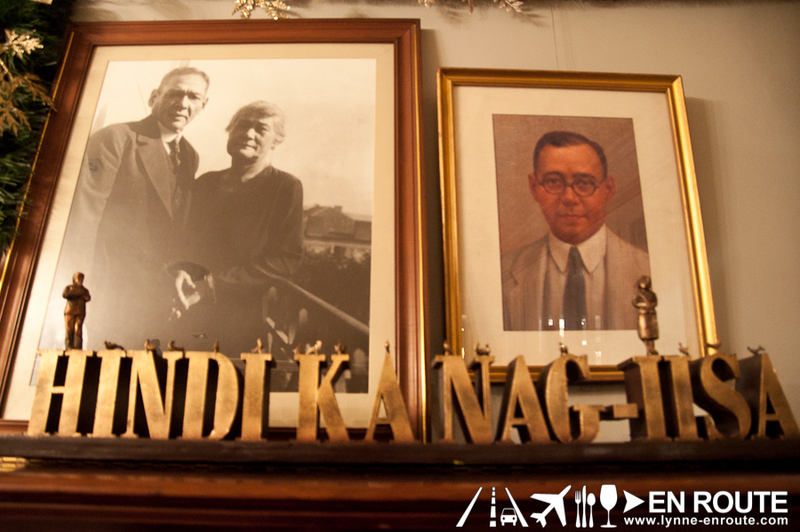 Want to know who started Liwayway, La Vanguardia, and the Tribune? This is the family. 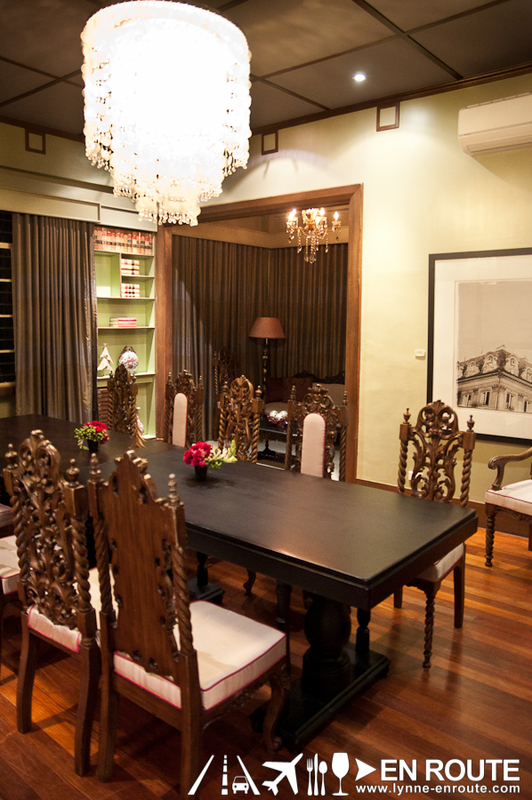 These rooms on the second floor of Casa Roces are for rent for private functions or for VIPs. 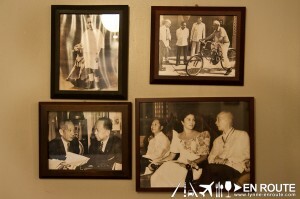 It is said that the President of the Philippines normally dines here, enjoying some of the turn of the century Filipino, Spanish, and American cuisine that the family loves to serve when they have guests around. The popular appetizer here would definitely be the Chorizos drizzled in balsamic reduction (PHP 355.00). 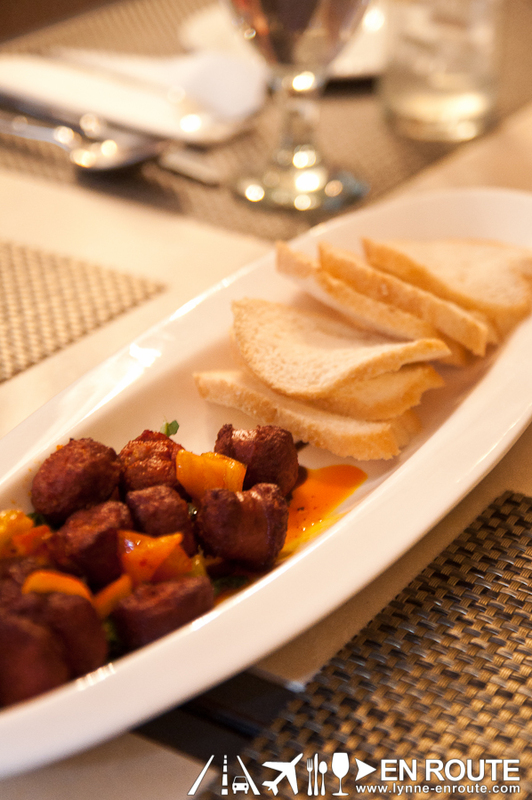 Chorizos have been part of the Philippine food culture for a very long time, and this one does not disappoint. 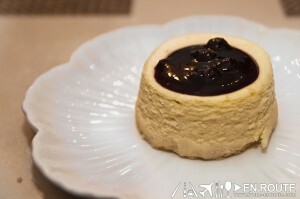 What may be a bit adventurous for the casual food goer would be the Creamy Pate topped with Black Caviar. 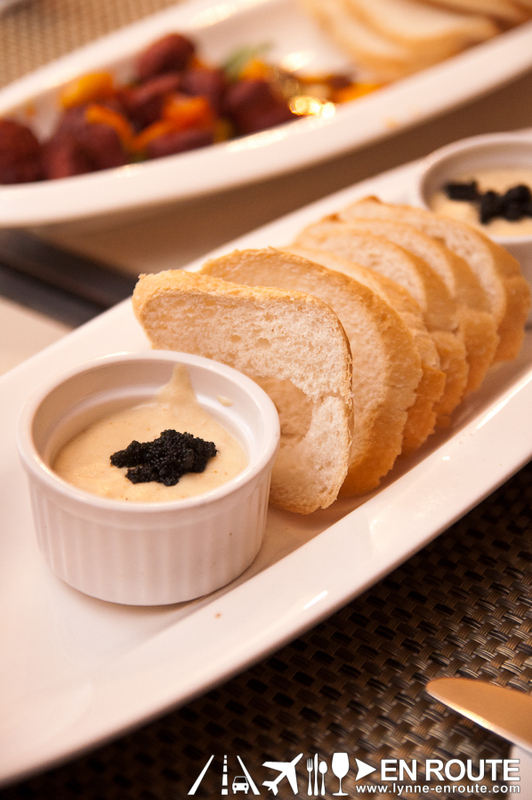 Caviar in itself is an acquired taste, normally associated with those who can afford to acquire it. 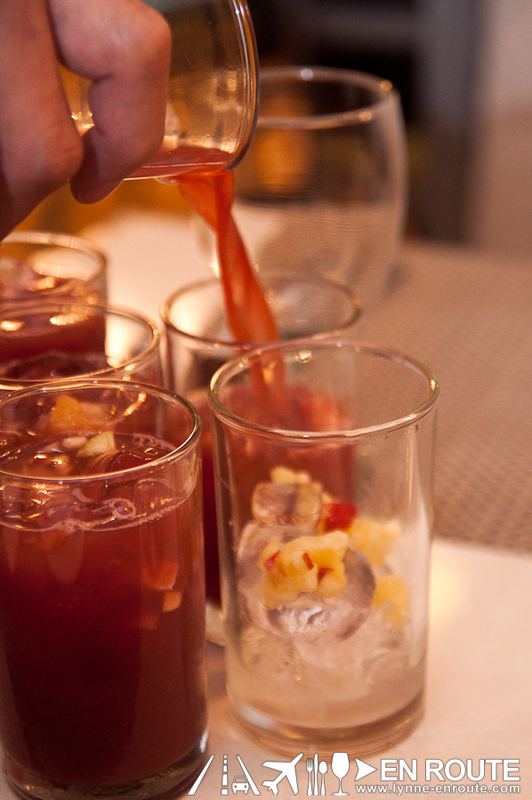 Nonetheless wash all of these with a nice, refreshing glass of their Sangria (PHP 165.00 by the glass, PHP 550.00 by the carafe). 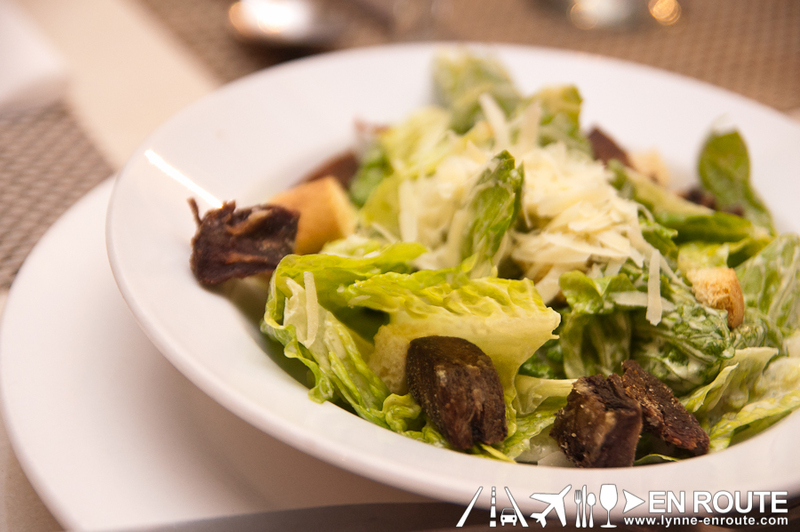 Lovers of lengua will be surprised to find a crispy version of it tossed along Ceasar salad (PHP 160.00). 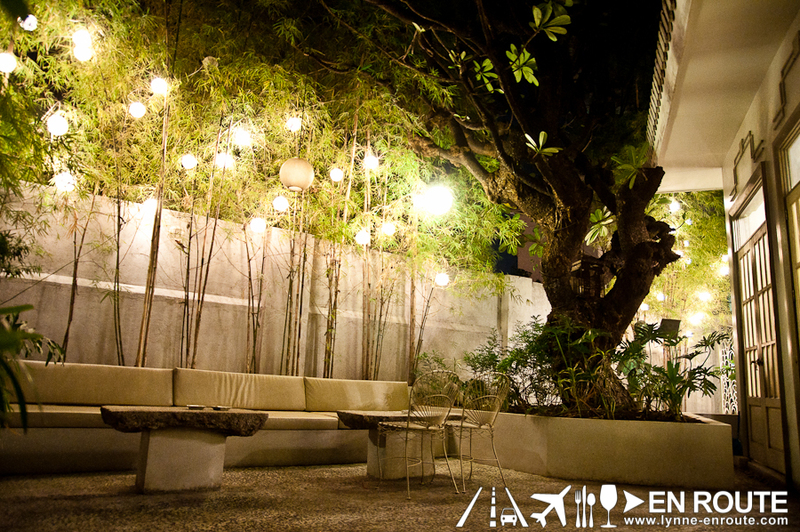 It is a strange combination with an effort to reinvent the leafy dining staple. But if comfort and familiarity is what you are after, the Sopa Molo (PHP 195.00) will hit the hearty note of the taste of home. If pasta is more of your thing, there are a few selections, but the Prawns Thermidor Linguine (PHP 390.00) will be the creamy seafood company you will want to have. 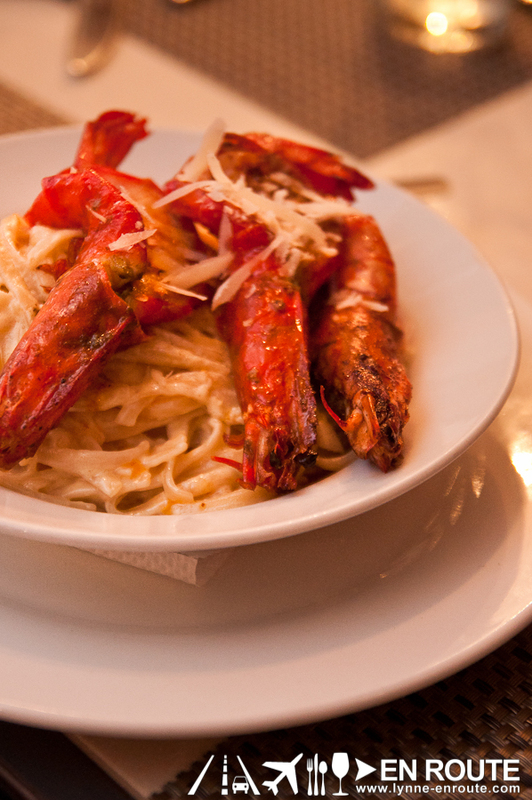 Shrimp thermidore seems to be a very popular dish for Fil-Spanish restaurants like the recently resurrected Casa Marcos, but it can be understood how the cream of this dish can mix well with an al dente cooked linguine. The pasta plate is presented well and looks appetizing from all angles. It can take some time to scrape the meat off the already open prawn shell. 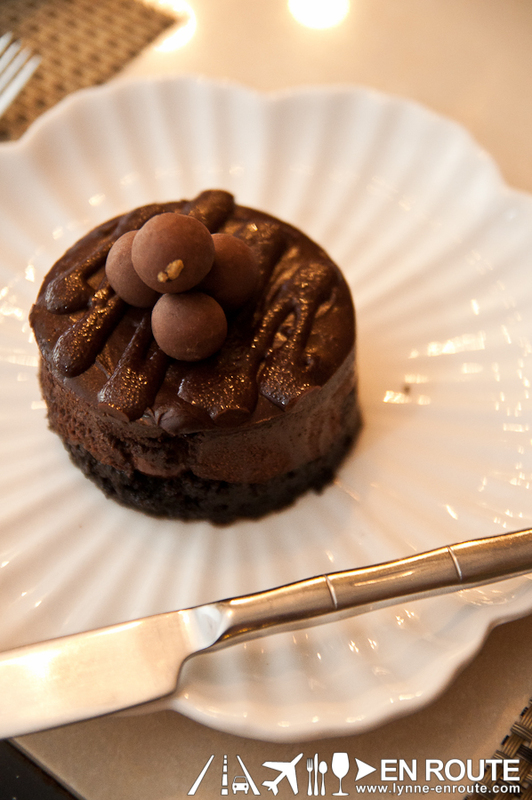 Think of that saying “The harder to crack, the sweeter the snack.” To get by as you twirl a pasta into your fork. Speaking of visual presentation. People who pay particular attention to the appearance of food will find that Filipino fares are not really one of the most visually appealing. 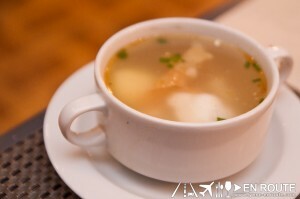 Most Filipino food are soups and stews, with a mixture of different ingredients all boiled into a thick sauce. 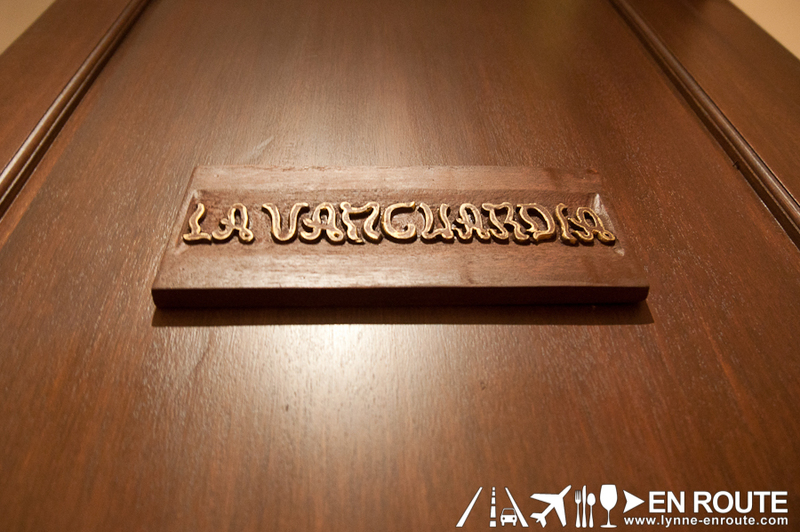 This presents a challenge to Filipino chefs, and is often compensated by ensuring that the flavors are spot on. An overhead view may be the best means to display this dish, and that may not even be saying a lot, either. 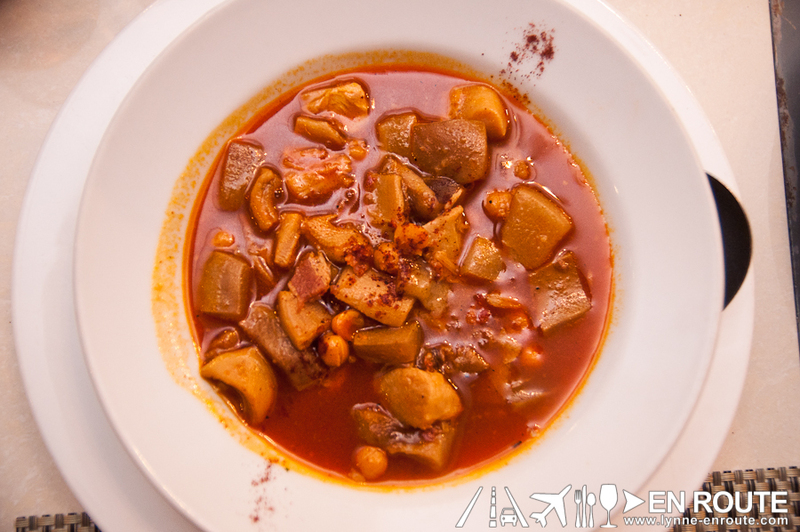 Only those familiar with its taste can already envision the celebration of mixing this over a bed of steaming hot rice. The trick is to savor its scent and then getting a scoop for your palate to discover that the taste makes up for its appearance. 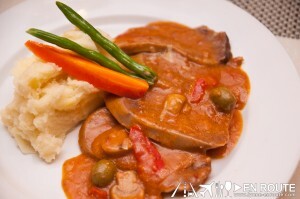 This goes also for their Lamb Kaldereta (PHP 520.00) and Lengua in Mushroom-Cognac Sauce (PHP 420.00). The Chicken Adobo Confit (PHP 285.00), allows for some plating experimentation on what is widely accepted the most popular Filipino dish. 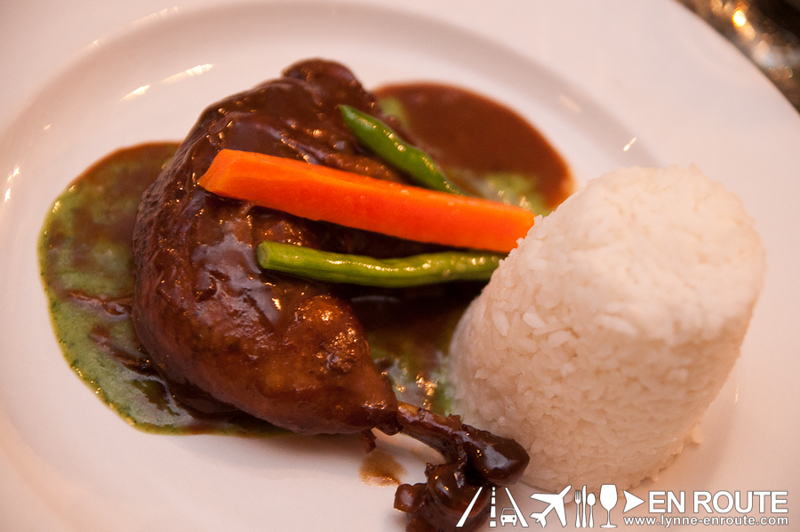 A whole chicken leg baked and lathered in an adobo sauce reduction. 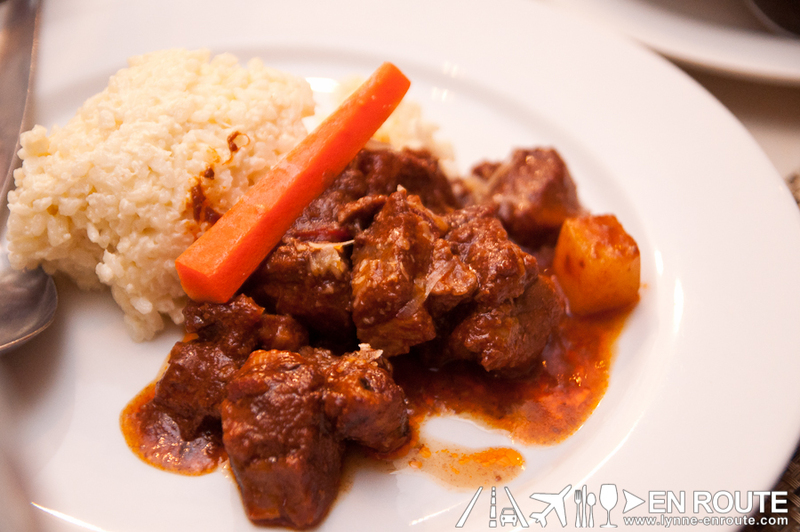 Very much adobo in taste, but with a richer sauce, gives a thicker feel that enhances the pepper and soy sauce, ending the taste buds with a faint vinegar tang. 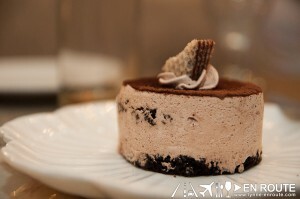 End your night with a sweet note from some of the Cravings Group’s cakes and desserts. A dessert station is open for viewing to pick whatever your fancy. 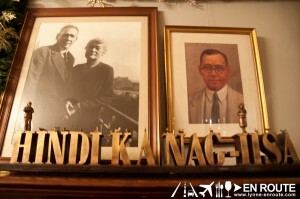 Stories of history, stories of flavors and abundance, and stories of legacy. This all seems to meld together in Casa Roces, as it invites tourists that tour the Malacanang grounds to savor a little bit of the history of one of the old clans of the Philippines, while having their taste buds and gastronomical cravings satisfied in the ordeal. It is a small celebration in itself, and best shared with the company of new acquaintances or with familiar faces. 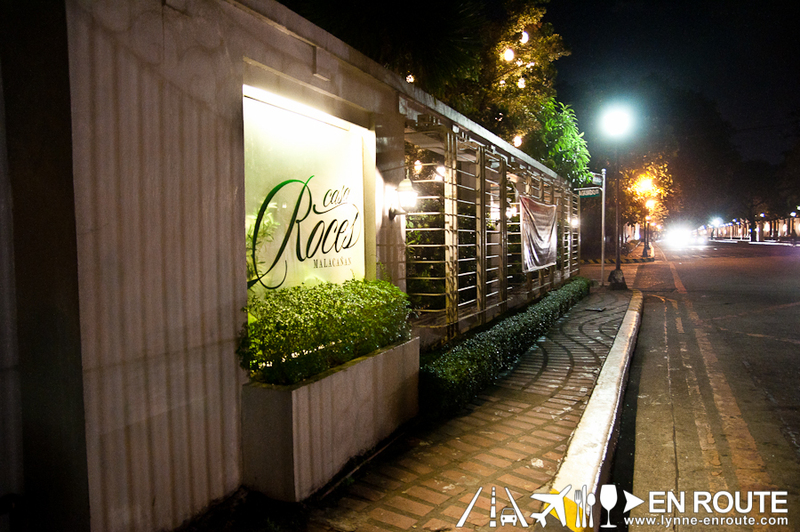 Casa Roces is located at #1153 JP Laurel St. Cor Aguado St. , 1005 San Miguel, Manila, Philippines. Note: You will be asked to leave your driver’s license as you enter the security area of the Malacanang palace. I’ve been wanting to visit this for quite a while. 🙂 Must give time for this soon.